Incredibly versatile! RYL Moor Mud for face, bath and or body wrap. RYL Natural Moor Mud when mixed with a tiny bit of water, can be used as a body wrap or poultice for isolated treatment. It is used for general body detoxification, pain relief treatment, facial mask, problem skin such as eczema, inch-loss wrap, and continued use will help with cellulite reduction. Photo of mud product inside packaging. Because of its incredible versatility, it can be utilized in combination with other popular body wrap therapy. An example of this combining Dead Sea Salt with your Moor Mud bath can be very beneficial, combine (50%-50%) this will naturally neutralize any harshness while boosting the effects quite substantially. This is due to the way Moor Mud improves the body's mineral absorption. Application: Apply a thin even layer of warm RYL Moor Mud to the treated area or the whole body. Leave on for 30 minutes, wrapped in a thermal blanket, foil or bandages, then rinse and relax wrapped in a dry blanket for 20 minutes. A 250 ml pack is good for 1 to 2 wraps. Can be applied anywhere on your body. Potent anti – oxidant: Combine Moor Mud with Brewed Green Tea instead of water. Effective anti – bacterial: Mix Moor Mud with Saprox clay. Treats psoriasis, eczema and fungi. Strong anti-inflammatory action, due to its high percentage of humic, fulvic acids, minerals and sulphur. 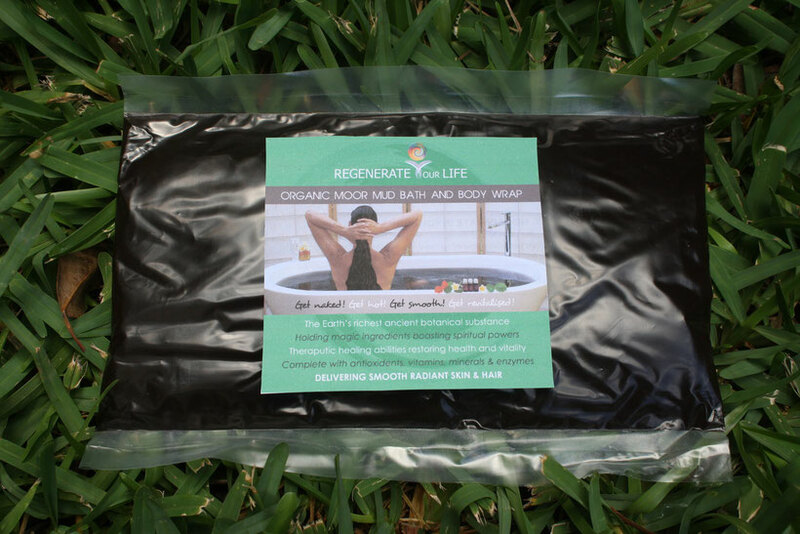 For pain relief of muscle soreness, post body work-out, or arthritis, use up to 3 x 250 ml pack in bath. Do not use a microwave oven to heat Moor Mud! Microwaves destroy some of the bactericidal qualities of Moor Mud and can dramatically reduce its effectiveness. If you desire to heat Moor Mud, put amount in a plastic bag that can be closed watertight and withstand hot water. Place the bag into a pot filled with warm to hot water (about 110º F 37 Celsius) leave it submerged for about 10 minutes. Do not boil. Only add therapeutic essential oils to mud bath. Bath water may become toxic if you add unnatural ingredients. Due to the muds ability to draw toxic waste, if you are a sick refrain from sharing a bath. This may be a health-hazard.